Jane Blundell Artist: Using Daniel Smith watercolour sticks to make palettes. Using Daniel Smith watercolour sticks to make palettes. Daniel Smith watercolour sticks cost less than a 15ml tube of DS watercolour paint but are made with 1.6 times the pigment load so they are a very economical way to buy watercolours - particularly the Primatek sticks which may be series 3 or 4 in tubes! Designed to be drawn with, they can also be cut up to create fast and convenient watercolour palettes, whether they are stuck into pans, half pans or directly into palettes. Here I have cut one stick of Buff Titanium into 5 pieces. You could cut it into 6 but 1/5th fills the half pan nicely. (For full pans use 1/3 of a stick.) I added a drop or two of distilled water to the pans to soften the watercolour stick and then pressed it in. I used one piece in a Masters palette as well. The very convenient part of setting up pans or palettes like this is that you don't need to wait for them to dry. You could just cut 1/5th off the stick for a palette and keep the rest to use as a drawing stick. They work best in less humid climates - they do tend to soften in humidity. 15. 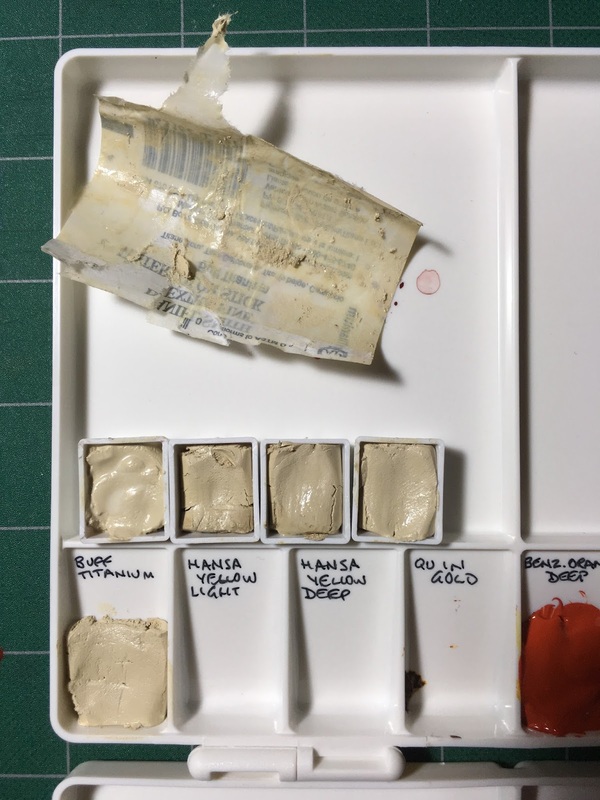 Jane's Grey - you need tubes to mix Jane's Grey so could buy ultramarine and burnt sienna in tubes. Or use Sodalite Genuine watercolour stick, as it is a very similar colour. 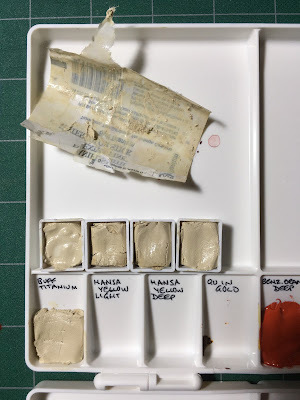 If you are using tubes or watercolour to make up pans or palettes, make sure you shake the tube well before you open it and always open watercolour tubes cautiously - the paint can flow out very fast at times. Ideally, fill the pan half at a time and stir thoroughly to make sure the pigment and gum arabic are thoroughly mixed. Allow to dry in a warm place and you are set to paint. Update 11/1/2017 - see more information, including the colours painted out here. "Great minds think alike." That's what I did with my Winsor and Newton Professional Watercolour Sticks. I ordered extra sticks in the colors I like and was able to fill 3 travel palettes from 15 sticks. Glad to get this idea, how best to cut them up? They are super vibrant, now I know why. Thanks. In Sydney, the humidity tends to soften them so cutting them is easy. If you are in dryer conditions, try putting them into a sealed container with a container of water in it - not so they are soaking in the water, that would make a horrible mess - but just so they are in a more humid environment - leave them for 24 hours in a warm spot. I think that will soften them. Or just use a sharp cooks or other kitchen knife on a cutting board! If you are not cutting the whole stick, just take the paper off the part you wish to cut off. In Hawaii I can't use the sticks for that reason...but love the Primateks so sticks may be the way to go. Once soft, couldn't they be cut with heavy scissors or light garden clippers? Thanks for the great information! Certainly. Once soft they can be cut with a palette knife! Thank you Jane, I have learned so much from you about pigments, and now if I can just retain that in my brain!! Brilliant! I have a sudden, pressing need to acquire some watercolor sticks! Thanks for all your helpful posts. I checked the DS website, and could not find green apatite in stick form. Do you think they had one and discontinued it? Your blog entry is perfectly timed. I am considering switching from Art Spectrum to Daniel Smith and thought the sticks might be an economical way to try them. Only trouble is, I live in Queensland - very humid in summer. Jane, I am switching to your 6 colour palette as detailed in your "Just 6 Colours" post and would like to get the DS sticks. Please could you advise me which colour to substitute for the Carmine as I can't find it in the stick form. I have posted a number of 6-colour palettes. The one you are referring to is http://janeblundellart.blogspot.com.au/2014/06/just-6-colours-lovely-limited-palette.html with hansa yellow medium (or you coudl use hansa yellow light), Quinacridone Gold, Carmine, Ultramarine, Phthalo Green and Burnt Sienna. It is a very workable 6-colour palette. Carmine is between Quinacridone Rose and Permanent Alizarin Crimson - it is a deep crimson rose colour. If mixing clean bright purples is most important, go with a Quin Rose stick. If mixing deep blacks, greys and aubergines is most important, go with a Permanent alizarin stick. If you want to do both get both reds or just buy Carmine as a tube. I've been very curious about the watercolor sticks, but I have no way to see or try them before buying and so wasn't sure about the benefit of buying a watercolor stick instead of or in addition to the tube color. Using them as a messy paint crayon doesn't appeal to me but the high pigment load and their usefulness as a pan paint is something I haven't seen explained anywhere else. Thank you for this. I remembered reading this and although I am not familiar with watercolor sticks at all I just bought five on eBay. All Daniel Smith New Gamboge. I e-mailed the seller and they are all Nickel Dioxine PY153. I am thrilled! I can't wait for them to get here. Hello, sorry if this is a silly question but I was wondering if it would work okay if I were to substitute some colors in my palette with sticks (for cost purposes) would that work, do the sticks mix well with paint? The sticks are simply watercolour made with less water so they are produced in a more solid form - more pigment, less water. Once the tube colours dry, they also end up being more pigment and less water so they really are the same thing. Using sticks where they are available is convenient as well as cost effective as you don't have to wait for them to dry in the palette, though not every colour is available as a stick. Alright thank you! I wanted to get some specific colors of Daniel Smith but Im trying not to spend too much so getting the stick versions is perfect alternative for me! Gamboge - what is it?